eXP-1S110L-BNC PoE Fast Ethernet Extender. 1 port 10/100Base-TX (RJ-45). BNC Interlink ( VDSL2 ) connector. Provides power over VDSL Link. 48V 65W adapter included. 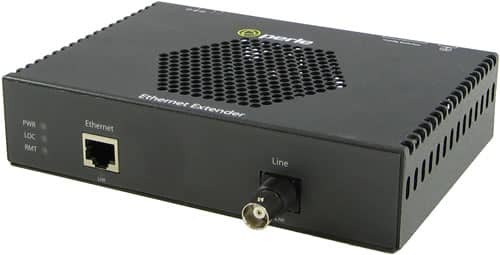 Perle Ethernet Extender enable data transmission up to 10,000 feet ( 3 KM ). Use single twisted pair ( CAT5/6/7 ), coax or any existing copper wiring previously used in alarm circuits, E1/T1 circuits, RS-232, RS-422, RS-485, CCTV and CATV applications. The on-board PoE power controller enables true compliance with IEEE 802. 3af and IEEE 802.3at. At the central site, the PoE Ethernet Extender operates as a Powered Device (PD) supporting end-span and mid-span power sources (PSE). The remote PoE Ethernet Extenders are classified as Power Sourcing Equipment (PSE) to provide up to 15.4 watts of power to PoE and PoE+ compliant devices such as IP cameras, VoIP phones and wireless access points. For complete product details and technical specifications, please visit our eXP-S110 PoE Fast Ethernet Extenders Product Page.